Audience: Local newspapers, websites, and other media outlets that reach a general audience. Purpose and use: Matte articles are prewritten articles for newspapers, newsletters, and other media outlets. They’re a great way to raise awareness with a large consumer audience. Tip: Work with your communications department to get this matte article published in a local media outlet. Emphasize that it has cleared, up-to-date guidance that comes right from CDC. You can customize all, some, or none of these options. If you choose not to customize at all, you can download the material as is with CDC branding. Tip: Make sure to share this matte article with your communications department in early December — ahead of the holiday rush. Have it ready to go out in early January at the latest. This image will appear in the page header (jpg, png, or gif image). The image will be resized to fit into a 7.10 inch wide by 1.51 inch tall box. Consider replacing this national data with regional information about radon and cancer rates, if available. He says it’s estimated to cause over 20,000 lung cancer deaths each year in the U.S, and that 1 out of 15 homes have dangerously high radon levels. Meghan Porter, of Elma, Washington, decided to test her home almost by chance. She learned about radon at her new job — with the Washington Tracking Network (WTN) — and decided to pick up a testing kit. "Until then, I’d never even heard of radon," she says. She was surprised by the results. Radon levels were dangerously high in her basement — specifically in her 9 year-old daughter’s bedroom. "If I didn’t have that job, it never would have crossed my mind to test," she says. "I had no idea that radon was something that could be in my home." Porter says she feels lucky to have found out about the radon in her home, and she now urges neighbors, family, and friends to test their homes too. "I tell people that nobody knows what’s under their house, so they don’t know if they have radon unless they test," she says. "It’s cheap too — so why not do it?" You can call your state’s radon office to get the name of someone who can offer advice. Add contact information for your state’s radon office. This image will appear in the page footer (jpg, png, or gif image). The image will be resized to fit into a 7.10 inch wide by 1.51 inch tall box. You may already know that smoking is the number one cause of lung cancer in the United States. But do you know what’s number two? The answer is radon, an invisible, radioactive gas—and if you didn’t know, you’re not alone. But many of the people living in those homes don’t have any idea, Whitcomb says. 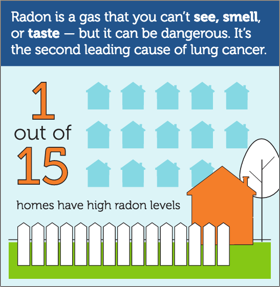 That’s not surprising, because unlike tobacco smoke, radon isn’t something you can see. You can’t smell or taste it either. "Testing your home for radon gas is the only way to know if it’s a risk," says Whitcomb. "The good news is that it’s very easy to do." High radon levels can be a risk anywhere in any state. 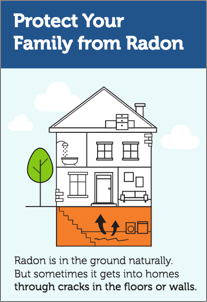 Both old homes and new homes can have radon problems. How much: High radon levels are more dangerous. How long: The more contact you have with radon gas, the greater your risk. Testing your home is the only way to find out if you have a radon problem. The U.S. Surgeon recommends that all homes be tested for radon gas. Radon gas forms naturally in the ground. Most radon mixes harmlessly with outdoor air, and we all breathe in low levels everyday, Whitcomb says. The problem is when radon from underground seeps into a home through cracks and gaps in the foundation and gets trapped inside. Breathing indoor air with high radon levels can — over time — damage the lungs and lead to cancer. Radon can really be a problem anywhere, Whitcomb says. It can be a risk in small homes and big homes, old homes and new homes. "You can even have two almost identical houses right next to one another," says Whitcomb. "One will have low radon levels while the other is very high. That’s why everyone needs to test." You can buy a testing kit online or at your local hardware store for just $10 to $20. You can also order one from the National Radon Program Services website or by calling 1-800-SOS-RADON (1-800-767-7236). "If you find out that you have high radon levels, it can be scary," says Whitcomb. "But addressing the issue is often simpler than homeowners expect." The key is to work with an expert who can help guide you, Whitcomb says.